The game is divided into large chunks of difficulties - subsectors. Every subsector will represent a player Tier. One Tier will include 10-20 power levels to gain. Arriving at the end of a tier will mean maxing out the current content and gathering "end-game" gear - until you arrive at the next tier, the next subsector, of course. Currently, the first Tier is available. 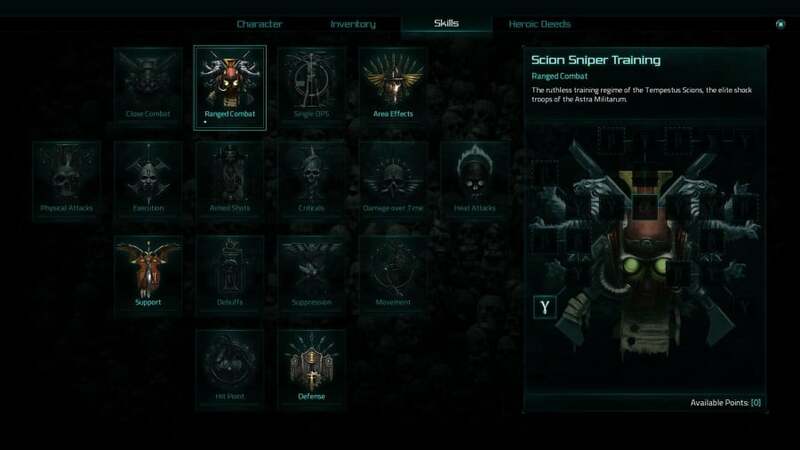 There is now a limited set of skill trees available for each class specialization. Choose wisely! Unlocking new Skill Trees can be done by completing Heroic Deeds. Existing map settings such as the Imperial Indoors setting will receive sub-settings continuously. The first instalment is the Nurgle Infested version. Sentry Trap: A large chest in the middle of the room. It holds great treasure...or is it a trap, spawning 3 sentries behind you? Skull Sentry Trap: Cross the laser beam between two skulls, and a sentry turret descends from above. Skull Sentry Floor Trap: Cross the laser beam between two skulls, and a turret emerges from the ground. Shrines: Activating the first Shrine gives you a sub-quest - if you activate all three, enemies will lose a chunk of their HP. Summoning Ritual: 3 cultists begin summoning a Demon if you approach them, giving a sub-quest to disrupt the ritual in time. Broken Turret: An enemy turret is being constructed - complete the sub-quest by killing all the workers - or face the barrage. Protect your Allies: A group of your allies is holding back the attackers! Protect them with all your might! Assault: A group of your allies is taking a heavily guarded enemy radio tower. Help them! Loads of new available item Enchants, just to name a few: Bonus Suppression per Kill, Bonus Suppression per Hit, Bonus HP regen in cover, Bonus Suppression regen in cover, Resist All, +HP/kill, Melee damage reduction, Ranged damage reduction, Inoculator Heal%, Inoculator CD reduce, Inoculator Capacity Bonus, Inoculator Duration Bonus, Inoculator Refill Bonus, Free Inoculator Use, Inoculator CD Reduction/Kill, Ammo Capacity Bonus, Overheat Reduction, Resource Cost Reduction, and so on! Are we playing the same game ? I have my assassin to level 4 after only 3 missions ? Methinks it's you, not the game. While there are finally noticeable changes to the balancing, it still has a long way to go. It really is hard for me to believe that this is the same company that gave us Van Hellsing. Right now, the biggest problem is the mob sizes and the over reliance on special enemies. They are hardly special if they're in every single mob. Admittedly though, Van Hellsing had this same problem with mob sizes, but it worked better because you had Katrina, and she did most of the work for you (it seemed). Yet it is clear from both these games that the devs have yet to figure out how to balance their games. Chaos Marines should be late game enemies, not something a novitiate would encounter on their first mission. These guys seriously need to sit down with Diablo and see how a AAA company scales a game from low to high level and from solo to a full group (whatever number that might be). Because right now, as far as solo is concerned, assault gunner is the only viable class and assassin is still completely unplayable.
" With this update, we have issued an aforementioned character wipe due to the massive changes to the skill system and game balance, not to mention itemization. Hopefully the new gameplay experience will prove to be a lot better :) "
Maybe they have to make it bold and pink next time to make it stand out even more! lol :D - The friends list wipe etc just comes with them resetting all information. It's normal. Complete Character Wipe? even Cabal and friend list...or am i doing smth wrong? just click the middle of the screen. Nothing is stuck for 95% of players, it's just a missing icon in the middle of the screen to click. After doing that the continue button will light up. Yep, i also was stuck in the reward screen but by clicking in the middle it advanced. Great update even with those minor bugs. same problem here.. if i restart the game i m still stuck in the mission complete screen without the ability to click the continue button ..
Last time I played was with the performance optimasion. There it was very well working with "very high" graphics. Now I have long loading screens again and needed to reduce to "low". Is it just my pc whats dieing or can it be that that patch made something bad with performance? Keep an eye on the forums buddy, i know there is a lot to read through - but we have known for 4 months that there would be 200+ skill points, 15-20 skill trees and 50+ perks :D - Trouble is when they respond to threads it tends to get lost in the archives of the forum xD - They certainly do listen though, and make changes where they can. i cant find the edit button or mybe i am just blind sorry for having 2 pose but keep up the good work if the Development team keep hearing our TOT and comment i just might buy the $300 founder pack just to support and show how much i appriciate what this team are doing. Thank you for making a great game i just might cry cause of how happy i am that i found a great game with a good team working on it. WOW i did not think they would listine to me when i told them gave a limited set of skill points and add alot of skill that way every one have a differen build not gave every one the all the skill point so how does every one have a different build when ever one have the same skill LOL. just click the middle of the screen when that happens. Its just that there is a missing icon to click. Oh my lord, I love you guys. This looks amazing ! Praise the Emperor !! Another good day to be an imperial citizen. Three meals a day and a new patch to play. This looks to be an amazing update huge Kudos to the whole team. Time to get testing, Happy Hunting fellow Inquisitors.